Midwifery is based on the strong belief that midwives partner with childbearing women and respect birth as a normal life event. April strives to empower parents with knowledge and supports their right to create the birth experience best for them. April respects intimacy, privacy, and family integrity, and draws on her own patience and understanding to provide care during pregnancy and birth. Midwifery is a good choice for you as long as you’re in good health (no serious chronic medical condition, such as high blood pressure, epilepsy, heart disease, or diabetes). 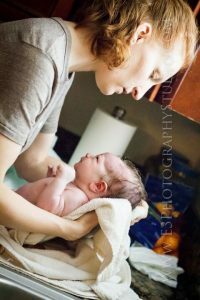 Midwives are an appealing option for women who want a more individualized, less routine approach to childbirth than most traditional obstetricians provide. They focus on helping you learn about the physical and emotional changes you go through during pregnancy, teach you how to maintain good health habits, and consider you to be an active participant in all aspects of your care. April sees every pregnancy as a unique event and encourages you to consider your options for labor and delivery and to personalize your own birth plan. Whatever kind of birth you choose, April will support you in your decision. Licensed and trained as a Registered Nurse and in midwifery. Experience as a registered nurse (generally labor and delivery, postpartum, or neonatal). April has experience working as a RN on all of these units. In Nevada CNM’s are licensed through the Nevada state board of Nursing and required to maintain continuing education in their specialty. Can provide care from “menarche through menopause” (menarche being the first menstrual cycle). Many insurance companies require a midwife be a CNM for reimbursement. Teacher’s Health Trust, TriCare, and Culinary are a just a few of the insurances that only recognize the CNM license. April is the only Certified Nurse-Midwife attending births outside the hospital in Southern Nevada. Licensed and trained in midwifery only. You can become a CPM without going to a school. This is accomplished via apprenticeship and licensure requires PEP (Portfolio Evaluation Process). If you go to school, you can go to an MEAC accredited school or one that isn’t accredited. Non-accredited schooling requires PEP as well.